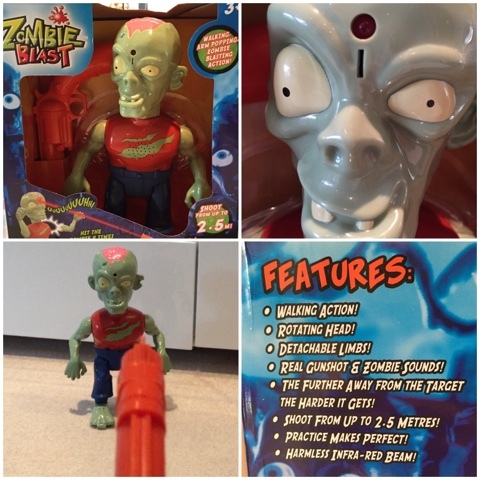 We definitely had a blast reviewing Zombie Blast - a fun indoor target shooting game all the family will enjoy playing. When this creepy looking guy arrived for review I instantly knew Ben, aged 6, who enjoys playing Monsters and Zombies in the playground with his friends would love him, but I wasn't sure how my 2 year old twins would react. It turns out they find the Zombie hilarious especially when he starts groaning and walking and love playing Zombie Blast just as much as their big brother. The idea behind Zombie Blast, an indoor target shooting game, is that you shoot the groaning Zombie down using a harmless infra-red beam before your time of approx 30 seconds is up. It works from up a distance of to 2.5m away so you can keep challenging yourself by starting near and making it harder by moving further away (I still can't do it from 2.5m). There are three stages to defeat the Zombie. First you have to shoot him three times to blast off one arm, then shoot him another three times to see his second arm detach, and finally after another three shots are landed on the target on his forehead he falls over. However if you don't do it in the 30 seconds the Zombie starts taunting you with his evil laugh which in itself is quite funny. It's brilliant fun to play. We have been having a lot of fun playing Zombie Blast. There definitely is a sense of satisfaction when you knock the moaning Zombie to the ground, especially when you have managed to do so from a decent distance. The good thing about the game is everyone, young and old can play as you can tailor shooting distance to suit the player. It can be played on your own or in groups and you can add an extra level of competitiveness by trying to beat your personal best when it comes to the shooting distance or time taken. An added bonus to the game is that as it is a target shooting game it really does require the player to concentrate and focus and helps improve hand-eye coordination and visual attention which is vital for skills such as reading. So there you go more reasons to give it a thumbs up! Zombie Blast is aimed at children 3+ and is available in store from the usual toy retailers and direct from Character online and Amazon with an RRP £24.99. *Disclaimer: I received Zombie Blast free for review. All views and opinions are my own and unbiased.